How to get there The climb starts from the north at Saanenmöser/Col des Mosses de Gessenay (1280m). There is only paths or gravel tracks down the other side. The road starts at the railway station in Saanenmöser and continues rather steeply up to the Hornberg, where there are two restaurants with nice views. Make sure to always follow the road that climbs. Other comments The road that goes left between the restaurants is a gravel road that is mostly fine to use with a road bike in good weather (it passes by Wengenpass/Parwenge (1836m), though it is a bit harsh down from Parwengesattel (1833m) until the asphalt starts (which it does fairly quick). Just after the fine asphalt roads starts, one could take off onto another harsh gravel road that (with perhaps a short walk) could take you over the Rüwlispass/Rüwlissepass (1718m) (I walked through the woods, thinking it was a good short-cut, which I now doubt). 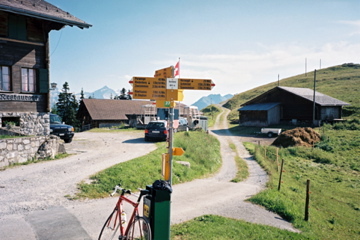 From Rüwlissepass, the road is partly concrete, partly gravel, but ok with a road bike until you rather soon comes to the asphalt road that takes you down to St. Stephan in Obersimmental. See also nearby Hinter Eggli (Eggli) (1590m/1660m), Gestelenpass/Meieberg (1853m) and Vorder Schwarzesee (Sparenmoos) (1621m).